M . . . .U . . . .S . . . T BREAK F . . . R . . . E . . .E . . .
You are pulling . . . me into . . . your web of . . . toooo . . . muchhhh . . . knowledge . . . . . I really do wish I could tell you how much I appreciate your efforts over the years. If there is one thing fans of B5 can say it is that they can always turn to you if they want to cut through the B.S. I know it might be better to be blissfully ignorant of such matters, but I am a HUGE believer in giving credit where credit is due. I am not someone who thinks JMS tries to steal all of the credit for himself, but I do know there are many people who have maybe never gotten the praise they deserve for what they contributed to the show. I am by no means suggesting that JMS purposely denied them that credit or had anything to do with that situation, just that circumstances in most businesses lead to underappreciated contributors. In that regard it is important that knowledge like this be readily available in case history starts to tell the story differently. When Babylon 5 becomes a religion in fifty years all of the contributors names should be remembered, unless they genuinely deserve no credit. Ugh, once again I come away from this website wishing I hadn't started a thread. I honestly dislike reading about all the politics and back-biting behind the scenes. Mostly because it seems people take sides and have agendas. To quote B5, "there's your truth, my truth, and the real truth in between." I suspect the real truth is somewhere in between. As for the individual creators not getting recognition – I was watching the show from the beginning. I bought all the science fiction mags with B5 articles, went to as many conventions as I could. There were plenty of articles and interviews with people like John Iacovelli, John Flinn, Ann Bruice Aling, various directors, various Optic Nerve and Foundation people, Chris Franke, George Jenson, the Official B5 magazine was filled with interviews with the crew, everyone from casting to grips. I met behind-the-scenes crew at conventions and got their autographs. I knew all their names and what they did just as well as the actors and JMS. So to say they've never got credit, that's rubbish – I can go to my file of old B5 articles right now and pull out a ton of interviews that says otherwise. Many of the behind-the-scenes creators did get well-deserved recognition in the media, or they certainly did at the time. Maybe it was different in the online groups where JMS was so prominent – I don't know, I wasn't online at the time – but the online groups shouldn't be used as the sole measure of all things B5. Technically, it's ""Understanding is a three edged sword." Three sides. Your side. Their side. And the truth." Thanks for the corroboration; I've been saying that for years now. Many people came to the scene late and only know what they found online. I've tried to explain that the support staff were given a lot of time in the spotlight. Sure, whatever (and yeah, I’ve said, and shown – and still maintain - that online there was/is way too much credit being handed to jms for things he had basically nothing to do with). But I thought I was talking about visual FX not being on film and John Copeland talking complete crap (and why he might be doing it after Looney asked) – I could have sworn that's what I was doing - and I like the “I suspect the real truth is somewhere in between” . . . . that so didn't confirm one of the points touched on. Anyway, My mistake for commenting – I forget once in a while and slip into doing it . . . . . . OK, here goes. . . . . I really hope that Amazon gets hold of those film transfers (which don’t exist but I have faith) so we can get that hi-def version of the show Joe was telling us about. Warner really hate B5 hopefully Amazon will do what's needed to get it . . . . and that Thornton guy had some nerve on him, I really liked the episode Severed Dreams and I would have been sad if they never paid him that 100,000 to release the FX for it. . . . . Faith manages, and all that. Was that better!? Sorry, now I'm just being a little rude. I'll leave you to your discussions. BTW. Genuinely nice conversation loon – it was interesting - you really need to change your tag, as a serious (and sincere) comment like that just sounds so wrong being directed to ‘Looney’. Last edited by Triple F; July 1st 18 at 13:49. Woh! Woh! Woh! Talk about hitting a TRIGGER!!!!! What did I say?! In my mind what I was saying was a lot less dramatic then what you all reacted to. But I know I accidentally hit on a topic that has been a point of argument for years now. I admit that I chose my words poorly when I said "there are many people who have maybe never gotten the praise they deserve for what they contributed to the show." I was thinking of the little people, like the set dresser who suggested one little change in Season One that became a big part of the background through the entire series. (That is a fabricated example from my imagination.) I was thinking of contributions like that from people who's names even die-hard fans will never know. I didn't mean to suggest people were not getting credit or were being denied credit. I meant you never want a person's contribution to be lost. And you never want their contributions to be lost to other people's versions of what happened. I was just pointing out that it is good people like Triple F have taken on the burden of knowing too much so I don't have too. But in all seriousness it is always good to know two edges of the sword so you can sort out that third edge. I wasn't trying to cause a debate. I just hit a trigger phrase with how I worded what I was trying to say. There is always going to be bickering, backstabbing, and B.S. behind the scenes of any entertainment production. Having someone like Triple F who knows something about that is great. Does that mean Triple F knows everything and Triple F's version is always correct? NOPE. (Sorry T.F.) It is just more trivia to add to the spectrum of the B5 Universe. It is sometimes negative trivia, but it is what it is. Triple F has heard and read certain sides of stories and other people have their sides of stories. It is all grey. It just happens that the topic I chose to mention has historically been a point of argument and I apologize for not being more specific. I know Jan, Triple F, and others have had to deal with A LOT of B.S., mis-information, and even bickering among themselves over the years. I didn't mean to touch on that fire. 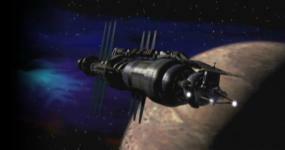 I just often think about all of the people who's names we'll never know who gave a lot to make Babylon 5 happen. Their names were never in the credits or on any of the awards and that is sad to me. People like Triple F have made the effort to find out some of those names and that is very important. Triple F has valid and interesting points to make. They often come off with a twist of negativity because they have to do with the reality of the fantasy we all love, but that three edged sword is something we always need to remember. My side may not completely gel with Triple F's side. Triple F's side may not gel with what I know. The truth is that neither of us were there and even if we had been our version of who did what when might be COMPLETELY different from what other's who were there might say. And come on Triple F!!!!! You have read what I write. How could I call myself anything but a Looney?! Woh! Woh! Woh! Talk about hitting a TRIGGER!!!!! What did I say?! In my mind what I was saying was a lot less dramatic then what you all reacted to. But I know I accidentally hit on a topic that has been a point of argument for years now. Sorry Looney, hope you don't think I was having a go at you! You didn't say anything wrong in my mind! TripleF – come on. In your posts that I've seen and on the B5 Scrolls website, you've always taken the side against the producers, to the point of bitterness. Looney mentioned people not getting credited – which is tied in with the Foundation thing, so not completely off topic – and having seen you make that statement too many times before, yes I guess I was 'triggered'. And you know, even if Copeland and Netter did the dirty on Foundation Imaging, they were the producers, it was their show! If they wanted to give Foundation the boot for whatever reason, however spurious, and launch Netter Digital, then they were entitled to do so, whether we liked it or not. Reading between the lines it sounds like both sides did things to piss each other off. But I have no reason to believe Ron Thornton's or Mojo's side of things any more than John Copeland's. None of us were there, none of us saw what really happened, and statements made by either side afterwards are obviously going to be heavily biased towards their own point of view. As I tried to say above in the quote that Jan corrected for me, the truth of what happened is probably somewhere in between. If people in the online community at the time didn't recognise the talents of people behind the scenes then that is disappointing and those people have missed out because there are lots of interesting stories about how B5 was made. Your B5 Scrolls website had some of those stories. I guess the Internet was still in its infancy back then and there wasn't the magazine-style websites that we have today. If all those interviews in print magazines like TV Zone, Starburst, SFX, Cinefantastique, Cult Times, Starlog, Dreamwatch, the Official B5 Mag etc were linked online, more fans might have seen them. (You know, you can still pick up all these magazines cheap on eBay and read those interviews.) I guess it was another example of the way the rest of the world had to catch up with what B5 was doing. And I would agree that, for new fans picking up the show on Amazon Prime, the existing fan community should make sure that those behind-the-scenes people who made the show do get credit in online articles and discussions. I think we can all agree that without Copeland and Netter, B5 probably would never have been made, and without the genius of Ron Thornton, B5 probably would never have been made; it certainly wouldn't have been as good. They were all vital to the show, and any disagreements or fall outs they had were over 20 years ago. Maybe it's time to let it lie and focus on the positive things they all did for the show. Very well said, but I will point out that I REALLY was not talking about the "Foundation" thing. I seriously do think about people like Bill Blair, Warren Tabata, Kim Strauss, Mark Hendrickson, and many others who put hours and hours of their lives into making B5 what it became. Those people actually got their names in the credits a few times, but there are many others who did those actor's makeup or fed them whom did not. Yes, I can see how that might lead people to associate that with the Foundation discussion, but that is not what I was thinking when I wasn't more specific. I was saying I appreciate Triple F's efforts to find out who some of the individuals are because it would be tragic if someone worked very hard to help make any episode of B5 a reality and nobody remembered it. And BTW, I am sooo glad I kept so many of those magazines. Someday I swear I will get some of them out and read them again. Back in the 90's if it said Babylon 5 anywhere on the cover or if by some miracle there was a Babylon 5 cover I snatched it up. I don't even think I read all of them. And to be honest some of the reason I snatched it up was because that stuff was so rare around here. I often had to go many miles to the nearest Barnes & Noble to find those magazines, so I likely don't have too impressive a horde of materials. Very well said, but I will point out that I REALLY was not talking about the "Foundation" thing. My sincere apologies if I misrepresented what you said. You said it like it seemed. The way I phrased it meant most people who know about these things would immediately infer I was talking about the "Foundation" thing. I just wanted it to be crystal clear that was not my intention. No reason to apologize because you were stating the obvious. What I said would cause people to immediately tie it to the "Foundation" thing because I wasn't more specific with my choice of words.